This is the time of the year when the elder tree does its thing. 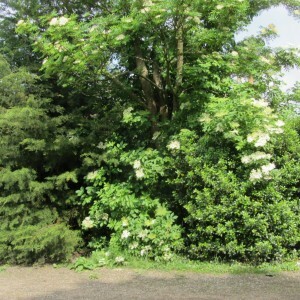 The elder tree is a pretty insignificant tree for most of the year, but when June arrives, it bursts into amazing blossom that has a peculiarly wonderful scent. The tree generally smells pretty rank, the leaves are somewhat poisonous and the wood, if you can actually get it to burn, gives off an acrid, unpleasant smell. Farmers dislike the trees growing in hedgerows because, unlike hawthorns and blackthorns, they are very brittle and animals can easily push their way through into the next field. However…….those flowers! 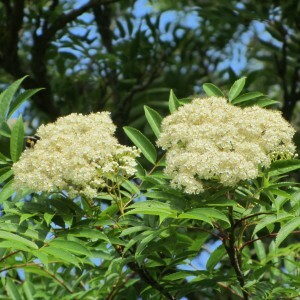 Pick the flowerheads on a bright sunny day, and you have the makings of wonderful elderflower cordial, elderflower fritters, elderflower wine and even elderflower champagne. Leave the flowers to mature, come back in September/October, and there will be a profusion of elderberries waiting for you (and the birds). These can be made into jam, wine or simply scoffed raw. Here is an elder tree along with a rowan, or mountain ash. On the face of it, they look pretty similar. The rowan (taller and more tree-like) is near the end of its flowering period, the elder (more of a shrub really) is at the start. However, the easiest way to tell them apart is by looking at the leaves. The rowan tree has small leaflets on each leaf, maybe as many as 10 on each side. 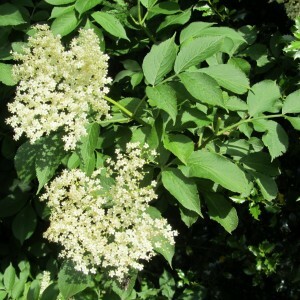 The elder leaflets are bigger and fewer in number. They also don’t smell nice – a dead give-away. The rowan flower heads are rather domed on top and very “blowsy” and smell like hawthorn, whereas the elder flower heads are pretty flat on top and smell just delightful. So there are some recipes on the “recipes” page if you feel inspired. Don’t delay, the flowers will start to fade in a couple of weeks, and then you’ll have to wait another 12 months!